The TransCanada Corporation requested on November 2 that the US State Department suspend consideration of its permit to build the Keystone XL pipeline. The pipeline, which would transport crude oil extracted from the Albertan tar sands to US refineries in the Midwest and Gulf Coast, has been languishing under review in the Obama administration since 2008. The Keystone XL pipeline is unlikely to be a pivotal issue in the 2016 presidential election, but it also will not go away, regardless of how the Obama administration handles TransCanada’s move this week. The pipeline has taken on enormous political significance for organized interests in the United States, a key front in the ongoing fight between the fossil fuel industry and environmentalists about the economy, energy, and climate change. For this reason, the presidential candidates of both parties are likely to continue to voice their support or opposition to the project. Ostensibly the reason for TransCanada’s request is that the company continues to face hurdles in establishing a route for the pipeline through Nebraska. The company now says it might take up to another a year to work out a resolution with state government officials there. Speculation, though, runs rampant that the move is a thinly veiled effort to find a more supportive president in 2016 and head off what most expect to be a decision by President Obama to deny the Keystone XL permit altogether. President Obama could in fact make such a decision soon. With the United Nations climate summit occurring next month in Paris, he may announce the rejection of the pipeline as a way to signal a strong US commitment to dealing with climate change. TransCanada also faces a less supportive political climate at home, following Canada’s national elections last month. Although newly elected Prime Minister Justin Trudeau publicly supports the pipeline, Canadians’ rejection last month of former Prime Minister Stephen Harper would seem to signal a weakening of domestic support for the pipeline. There is growing sentiment that Trudeau would not fight a decision by the Obama administration to deny the permit. A day after TransCanada’s request for a delay, the Obama administration indicated that the request would not impact the timing of any decision. In this way, TransCanada’s latest move does not appreciably move the policy needle on the pipeline, one way or the other. Of course, the Keystone XL pipeline debate has not really been about policy for some time. Instead, it has become a largely a political battle that has taken on more symbolic than substantive importance. On one side are supporters, particularly the oil and gas industry, congressional Republicans and some moderate Democrats. They point to the pipeline’s economic benefits and its potential to enhance US energy security. Keystone XL’s detractors include environmental and climate activists and most congressional Democrats who argue that tar sands oil must remain in the ground because of its large carbon footprint. The issue came to an apex earlier this year when the president vetoed legislation that would have forced the US State Department to approve TransCanada’s permit. But, this veto – just the third of Obama’s presidency – by no means resolved the controversy, and the dispute has already spilled over into the 2016 presidential election. In September, Hillary Clinton publicly announced her opposition to the Keystone XL pipeline, a position shared by all of her Democratic primary opponents. For their part, all of the Republican candidates seem to support the project, pointing specifically to the jobs that would be created by building it. Democratic and Republican candidates each appear to think they have the public on their side, pointing to competing survey results. 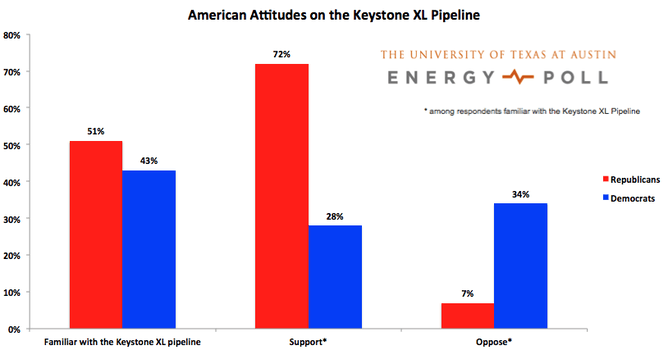 Republicans highlight surveys that consistently show that a strong majority of Americans support the Keystone XL pipeline, while Democrats point to polls indicating that the American public wants to move the country away from the use of dirty fossil fuels and toward cleaner energy sources. Like “ANWR” and “Solyndra” before it, the Keystone XL pipeline has entered the lexicon of contemporary environmental politics. The mere mentioning of the pipeline has become the proverbial “red meat” for the strong partisans on each side of the issue, providing candidates with the opportunity to strengthen their bona fides with their key political constituencies. The issue itself, however, is unlikely to engender much attention from average voters. An April 2014 poll conducted by researchers at the University of Texas, Austin found that just over 40% of the public was even familiar with the Keystone XL pipeline. This lack of public attention might surprise ardent proponents and opponents of the Keystone XL pipeline who have been engaged in bitter political fighting on the issue for much of this decade. The poll also suggests that, despite all of the attention and contention that Keystone XL has created, it is still a marginal issue for most voters. But because of the sharp ideological lines it draws, politicians will be compelled to take a position on it – regardless of Obama’s final decision.